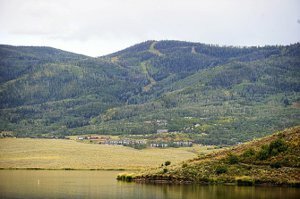 Stagecoach is located about 20 minutes drive from it's more renown neighbor - Steamboat Springs. Stagecoach sits on the shores of Stagecoach Reservoir where locals and weekend enthusiasts enjoy fishing, boating and camping. The adventuresome spirit abounds as well for hunting, hiking and biking as the area is surrounded by National Forrest and is blessed with breathtaking natural beauty. Due to it's proximity to Steamboat and affordability (in comparison to the higher prices of Steamboat), Stagecoach is both a bedroom community of people who work in Steamboat but also second home owners or "weekend warriors" who enjoy the outdoors the region has to offer.